In the year 1992, the Indian stock market crash due to Harshad Mehta scam. Before the scam hits on Dalal Street, Indian major and only one Indices SENSEX were trading above 2000 level at the end of January 1992. At the end of February 1992 SENSEX were trading above 3000 levels, that is 50% return within one month. Even the momentum did not stop and it continues its up move with great pace and reached above 4000 level at the end of March 1992. Imagine how much money people had made in just two months. If you were trading at that time and invest 1 Lacs your money will get doubled in just 60 days. Harshad Mehta trades heavily in ACC and the share price soar from Rs. 200 to more than Rs. 9000 and returned more than 4500% on investment in just a few days. Harshad Mehta was born in Gujrat and his father was a small business owner. Before entering into the stock markets, he was doing odd jobs and after a few years, he became a stockbroker. During the early ’90s, people started to call him the “Big Bull” of the Indian stock market. He was living more like a celebrity lifestyle and acquired sea facing 15K sq.ft. penthouse with Mini Golf course and swimming pool. Furthermore, he was driving the luxurious car like Toyota Lexus, Corolla Starlet, Toyota Sera, and more. Before the stock market crash, Harshad Mehta becomes a member as a stockbroker in Bombay Stock Exchange. After that, he started his own firm GrowMore Research and Asset Management. He actively started to trade in stock markets. In the early ’90s, a large pool of retail and big investors join hands with him and began to invest in his firm and also using his services in anticipation to make more money. In the early 90s Banks were not allowed to invest or trade in the stock markets. So, a bank can buy stocks from a stockbroker and bonds from other banks only. There was a big loophole in the system and Mehta takes the advantage out of it. To buy more shares he needs capital that he can get from banks only. He gave a higher interest rate to banks, and ask them to transfer the money into his account. Mehta finally uses that money to buy shares and when the stock price appreciate, he sells them and returned the amount borrowed from banks and keep the balance amount for himself. Normally Government issues securities like government bonds to cover their project expenses at an interest rate. Whenever a bank requires cash then they sell their securities to other banks and take a short-term loan. After some days seller bank returned the loan amount with interest to the other bank and buyback its Government securities. It is like whenever you need money you may exchange your asset like gold or any property and in return, you’ll get cash. And after some days you repay the borrowed amount with certain interest and get back your asset. So, a bank also does the same thing and uses Government securities in Ready Forward deal to get a short-term loan. 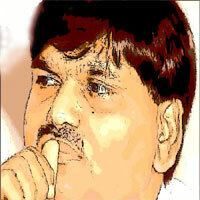 Harshad Mehta played a role as a bridge between two banks. He approached both banks that want to buy and sell the Government securities. In a ready forward deal, stocks were not allowed to move from one bank to other banks. Instead of that, the seller bank issue a Bank Receipt to the Buyer Bank that confirms the sale of securities. He approaches many banks and uses Ready Forward deal to invest in stock markets. Whenever a bank wants to sell its securities, Harshad acts as a mediator and take some days to find a buyer. Even, he asked the buyer bank to give him some days to find a seller of Government securities. In the meantime, he kept the Government securities and the borrowed money to himself. As per RBI guidelines, a bank can issue a cheque only to the seller of the securities. But Harshad Mehta lures the banks to issue cheque only to his name and in return, he pays a higher rate of interest. He started to invest that money into the stock markets and after some time sell his stocks at a higher rate. When seller bank of securities asking for money from Harshad he finds another buyer of Government securities. So, he always rotates the government securities from one bank to another. In this way, he makes lots of money by trading in stock markets. Harshad Mehta goes one step further and uses fake Bank Receipt to get more money from banks. Mehta approaches the Bank of Karad (BOK) and the Mumbai Mercantile Co-operative Bank (MCB) that could issue fake Bank Receipts. He uses those fake BRs and sell them to other banks and the banks in returns gave money to him. The banks actually assume that they were lending money to Mehta against government securities. Harshad then invest that money into the stock markets. So, using fake BR, he gave shape to his scam that led one of the biggest stock market crash in India’s stock market history. In 1992, when Harshad Mehta scam hit the Dalal Street the stock market crash by more than 50 percent in a year. It was one of the biggest crash ever happened in India’s stock market history and people witnessed bloodbath like never before. SENSEX shed over 2000 points in a year from crash date. Everyone loses money especially small investors were hit badly. In the next two years from the crash, markets remain in bearish mode. On 23rd April 1992, Suchita Dalal exposed Harshad Mehta scam and banks started demanding their money from Mehta as they come to know that the BR was fake. The stock market reacts to the scam and crashes badly and so, Harshad also makes a huge loss. Due to his loss, he unable to pay back to the banks. Later he was charged with 72 criminal offenses along with more than 600 civil action suits were filed. Finally, he was arrested and banned from the stock market for life. He died at the age of 47, on 31st December 2001. I hope you liked this post on Harshad Mehta scam that led stock market crash in 1992. You can comment below to share your views and opinions. Don’t forget to like and share this post on your social networks like Facebook, Twitter, Google+, and others. Ratan Kumar, an enthusiast stock market trader & blogger. He is the founder of akme. Forecasting stock market moves with the use of technical analysis since 2008. For the technical trader & investor, new or experienced, he provides legitimate and valuable advisory from day trading to long-term investment horizon and helped thousands of investors to make money out of the stock market.